Parents and students in Brookline, Massachusetts, are pushing to get a middle school teacher his job back. 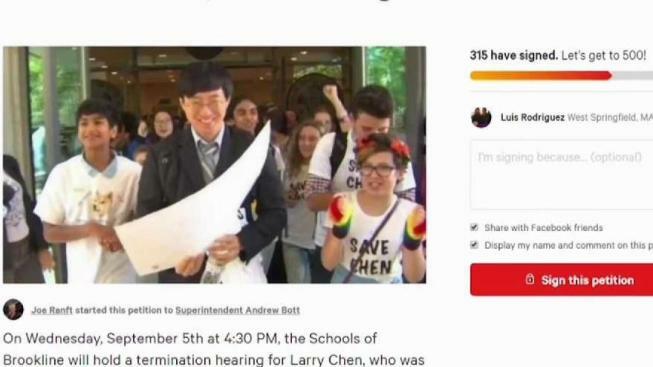 Larry Chen was fired for playing video games during homeroom. School begins Thursday at Heath Elementary School in Brookline, but one of its most popular teachers will not be there. Larry Chen, the school's sixth-grade social studies teacher, is not in class to teach his students after he let his students play "Halo" last school year. Allowing students to play the video game resulted in Chen receiving a "notice of intent to terminate" from Brookline Public Schools Superintendent Andrew Bot. "Halo" is either a first-person or top-down shooter video game. It is rated for teens or mature players age 17 and up, according to the game's website. A hearing to determine the fate of Chen's role as a teacher took place on Wednesday. Chen tells NBC10 Boston no decision was made, but that he will not be there for the first day of class. Brookline Public Schools failed to provide a time frame for when a final decision would be made. Students and parents filled Brookline Town Hall on Wednesday to support Chen. His unconventional teaching style has made him a beloved figure within the community. "He inspires his students," parent Mneesha Nahata said. "I mean, my son came home every day super excited to do homework, which is hard for a sixth-grade boy." "The 'Halo' video games were not in any way part of or connected to the sixth-grade curriculum and the Public Schools of Brookline does not endorse or condone this activity for students in school." "He's really helped me learn a lot," a former student said. "He’s made it really fun and out-of-the-box thinking and I would be really sad to see him go."